Friends, families and even strangers held vigil on the National Mall for a man fatally wounded by U.S. Park Police. 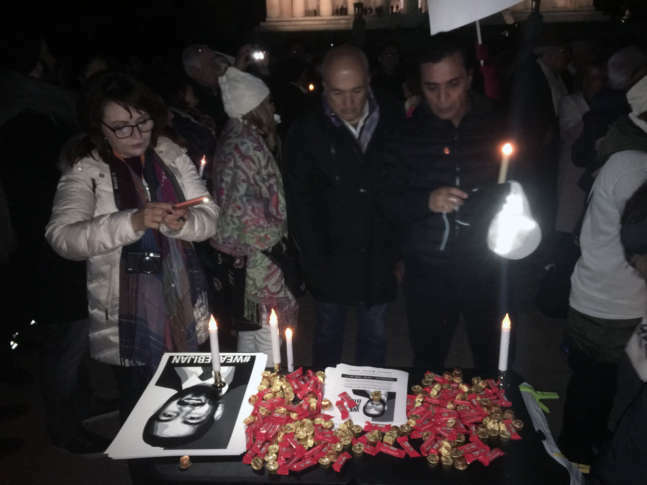 WASHINGTON — The reflection of hundreds of battery-powered candles glimmered from the pool at the Lincoln Memorial, as friends, families and even strangers held vigil on the National Mall for a man fatally wounded by U.S. Park Police. Bijan Ghaisar, 25, an accountant from McLean, Virginia, died after being shot three times by police on the George Washington Parkway in Fairfax County on Nov. 17. Police say the shooting occurred after Ghaisar led them on a short pursuit. Negeen Ghaisar fought back tears while remembering her brother at what she said was the family’s favorite site to visit in D.C.
“Growing up with ‘Bij’ as my sibling was the greatest gift of my life,” she said. Ghaisar’s father, James Ghaisar, said his son’s big heart left the world a better place for everyone. “Although his life was unjustly, unfairly, untimely, violently taken as an un-unarmed [sic] man, his dream of a peaceful world remains with us to fulfill,” his father said. While recalling stories about time spent with Ghaisar, several speakers expressed anger over what happened to the Virginia Commonwealth University graduate. Investigators say the pursuit of Ghaisar began when he led police on a chase after being involved in a hit and run crash, ending in the shooting. The FBI is conducting an independent investigation into what happened, but many questions remain about what took place in the minutes before the shooting occurred. Roxy Jahangeri, who spoke on behalf of the family, said the healing process can only truly begin for Ghaisar’s family members once those questions are answered. “It doesn’t make sense, it doesn’t make sense to anyone,” Jahangeri said.